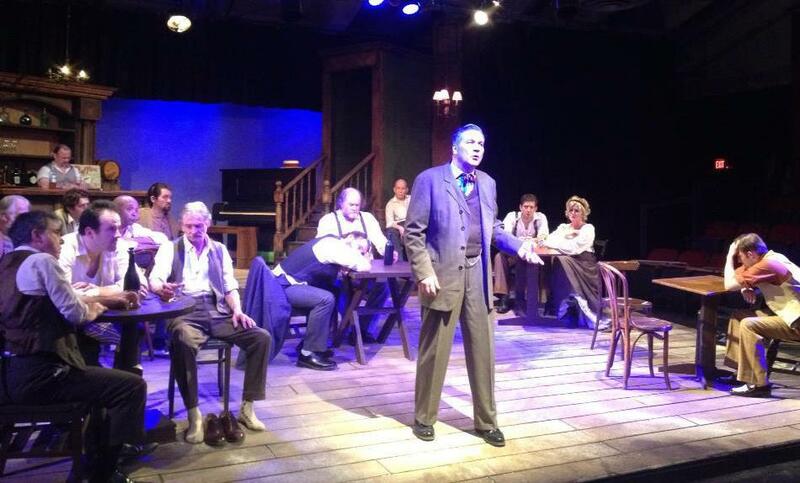 Hickey (Dana Hart) ‘inspires’ his fellow saloon regulars. Peter Roth and I got over to Ensemble last night to let The Iceman Cometh “wash” over us, as Eric Coble put it in a post. It did indeed. Four hours of washing makes for a very good scrubbing. The language does indeed wash over you and sweeps you up and spins you off and out to sea. I was reminded of Dylan Thomas’s Under Milk Wood with the powerful language and intense development of many, many characters. The play is truly a mammoth undertaking to see, let alone, I’m sure, to act in, or direct and stage. I can only ponder that effort. I remember going to Stratford one year and watching Night of the Iguana and thinking about how relentless and draining acting in that piece must be. Watching Iceman was confirmation again about the physical requirements of acting in a play that is long and filled with emotional power. Fortunately for Ensemble, the assembled a great cast with many of my favorite actors in Cleveland, including Michael Regnier (who was in my thesis play), Robert Hawkes, Bobby Williams, and Allen Branstein. I won’t discuss O’Neill’s play that much, as there are other places online that discuss it and do a far better job than can I. All I can say is that I’m glad I got to see it. The folks at Ensemble did a great job.